Sandi Harrison began writing professionally in 2010, contributing articles for various websites on mental health topics such as anxiety disorders. She received her Bachelor of Arts degree in liberal arts/mental health and culture in 2008 from Vermont College, and her Master of Science in psychology from the University of Phoenix in 2009. 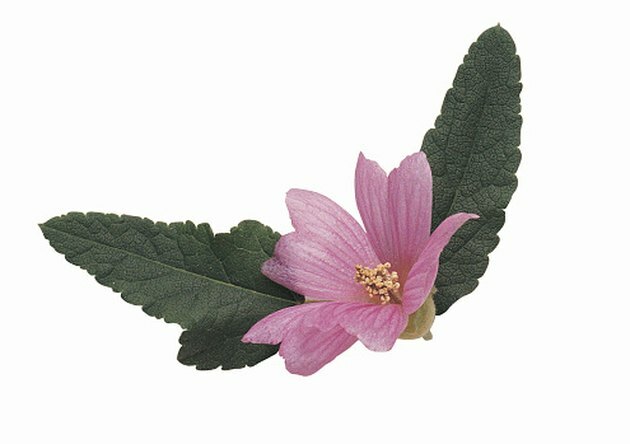 One of the latest trends in healthy supplements is the malva verticillata plant, more commonly known as Chinese mallow or mallow. The plant was originally grown in southern Europe and Asia but now grows from July to September on plains and arable fields all over the world. It is related to the marshmallow and hibiscus plants and is mainly consumed as a tea. The leaves and seeds can be eaten raw or cooked. Leaves added to salads add a pleasant, mild flavor. The seeds have a pleasant nutty taste. As with any herbal remedy, consult your physician before starting any regimen. Malva verticillata seeds contain mucilage, polysaccharides and flavonoids. Mucilage is made up of complex carbohydrates which, along with flavonoids and anthocyanidins, give it its soothing activity. In herbal medicine it is considered a demulcent which aids in eliminating irritation and mild inflammation. Mallow has been used as a food and medicine since ancient Greece and Rome. It was considered helpful as an anti-inflammatory agent for the skin, gastrointestinal and respiratory tracts. Major uses of mallow are as a tea for dry cough and sore throats, or as a topical, gelatinous application for dermatitis. Mallow is also used for treating renal disorders, retention of fluids, diarrhea and frequent thirst. For people with whooping cough, the root is used to make them vomit. The leaves and stems have digestive properties and are given to women in late pregnancy. According to test tube studies reported by Providence Health Services, one carbohydrate in mallow was shown to inhibit the complement cascade. The complement cascade has been implicated in autoimmune disorders and cases of chronic inflammation. The studies also showed that the seeds contain a polysaccharide which stimulates the white blood cells. In another test tube study, crude powder was shown to have anticancer effects. More research is presently being done. There are presently no known side effects of mallow. When mallow is grown on inorganic soils that are nitrogen rich the leaves have a tendency to have a high concentration of nitrates, otherwise the leaves are healthy when grown organically. What Are the Health Benefits of Kokum?